Despite almost universal opposition to the cruel way calves are treated, the Humane Society says the veal industry shows little signs of changing. That’s why many people simply refuse to eat veal. I was one of them. The veal industry is a by-product of the dairy industry. To get the dairy cows to produce milk, they are impregnated every year. Half of their offspring are male, no use to the dairy business, and those are the calves that become veal. I said I was one of the people who didn’t eat veal. What changed was my source. A few years ago, Sweet and Salty Farm (www.sweetandsaltyfarm.com), a dairy farm down the road from me in Little Compton, Rhode Island, began selling their own line of yogurt and cheese. And like most dairies, when calves are born, they have no use for the males. But rather than taking them away from their mothers and caging them for their short lives, they allow the calves to stay with their moms, nursing for up to four months before weaning. Then they graze in the fields by their mothers’ side, living a stress-free life. And when the time finally comes, they are dispatched humanely. The result is incredible grass-fed veal I don’t feel guilty about eating: a rich, red in color…nothing like beef and a far better option than conventional veal. I also buy the veal bones from the farm to make a rich, flavorful veal stock, roasting the bones on a baking sheet with onions, carrots and celery…then moving them all to a large pot of water that cooks for 24 hours. 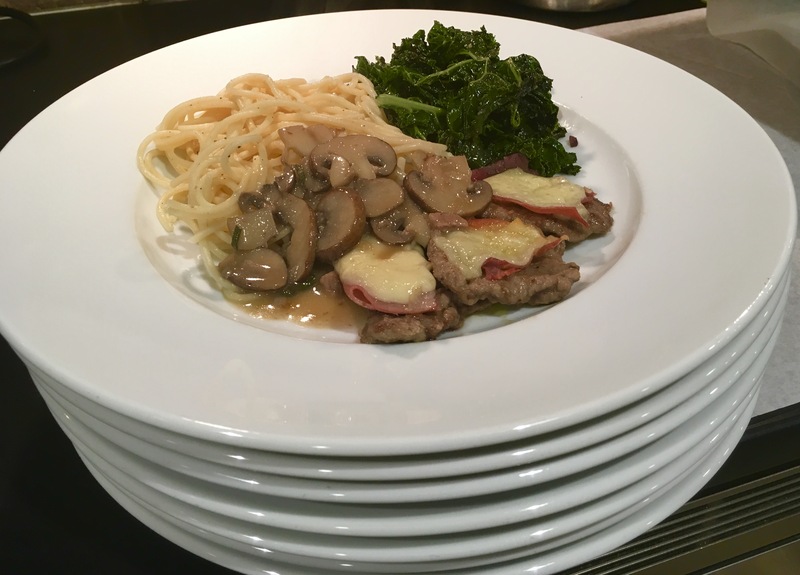 Traditionally, veal saltimbocca consists of veal medallions rolled with prosciutto and sage leaves. Often it is served with a marsala sauce. I got rid of the marsala–too sweet–and substituted a chardonnay. I added fontina cheese. And a guest’s aversion to spinach gave me the option to use kale…with bacon, of course! By the way, if you’re not lucky enough to have a farm that humanely raises veal (or you’re still queasy about veal in general), this recipe works with chicken breasts, too. Place the veal cutlets on a cutting board between a few layers of plastic wrap. Pound the cutlets to about 1/8″ thickness. Cut them into pieces about 3″ around, which will make them easier to handle. Place the flour in a bowl and add the teaspoon of salt and 1/2 teaspoon of pepper. Mix well. Heat a couple of tablespoons of olive oil and butter in a pan. Drop the veal medallions in the flour and coat both sides of the meat, shaking off any excess. Carefully lay the veal in the pan and cook the veal until it’s just barely browned. You don’t want to cook it all the way through. When the medallions have cooked, place them on a baking sheet. Cook the medallions in batches, adding more olive oil or butter to the pan if needed. When you’ve cooked all the medallions, use the same pan to sauté the onion until translucent. Add the mushrooms and cook them down. (You can add a little of the veal stock to help the mushrooms release their liquid.) Add the rest of the veal stock, wine and sage. Cook over medium heat until it’s reduced by half. If the sauce looks a bit thin, make a quick roux in a separate pan by heating equal parts melted butter and flour until it forms a paste. Stir this paste into the sauce, making sure there are no lumps. Back to the veal medallions: place a piece of prosciutto on top of each medallion, and then a slice of fontina on top of that. Keep the baking sheet with the medallions in a warm (150 degree) oven. Boil the spaghetti in well-salted water until al dente. Strain and toss in a bowl with unsalted butter. Season with a bit more salt. When you’re ready to serve, turn the oven on broil and place the baking sheet with the veal medallions on the top rack. You want the cheese to melt, but you don’t want it to burn, so keep an eye on it! Serve a few medallions on the plate, with spaghetti, kale and sauce on the side.